The more things change, the more they stay the same, right? That’s how it seems, in a soothingly familiar way, as seed starting 2010 really gets in gear at this new farm location. A little over two weeks since we set up the seedling room, and the fairly intricate task of managing dozens of crops and varieties and thousands of seedlings is on! It can be a little complicated, keeping track of all the details, but it’s also…simple. Kendall, trying her hand at tiny farming-style veggie production for the first time, shows no fear with the sharp, little snips, as she learns about thinning onions (above). We’re multiplanting this set of onions, aiming for four per plug sheet cell. Since I used seed from last year—a common rule is that you should get allium (onion family) seed fresh each year to ensure good germination, but why waste? !—we went a little generous in the seeding. Germination was great, and now we need to remove the extras. 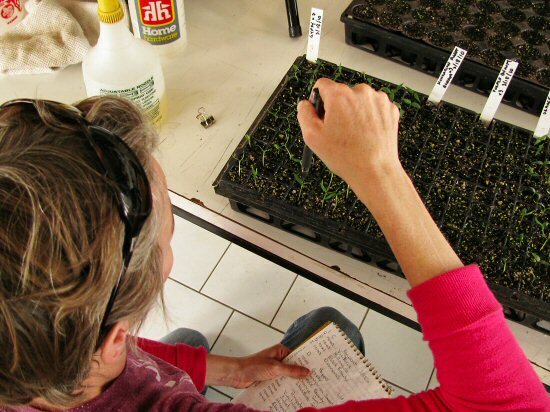 Next, Kendall’s on to another kinda critical seed-starting task: taking inventory of what exactly we’ve got going. That means a lot of counting and note-taking, and making sure the markers in the trays don’t get pulled out. Below, she tallies some of the 20 or so varieties of sweet and hot peppers that’re on for this season. For the new girl, it’s business as usual! Good to hear from you Mike. Updating websites are a big chore. Best of luck with rest of the season. Good to see a fresh post and to know all is well. Great blog, and I was also one who missed your posts but did not want to pile on with a comment. Glad to see you posting again. That seed starting business always seems complicated to me, something I’m always late getting started at. This year we planted some started seedlings that included broccoli – something we’ve never planted before – and were amazed with the crop that we harvested. May have had something to do with the 18 inches of rain we’ve had in central Wisc. Our current major crop is mosquitoes – I’m almost afraid to go outdoors. Good luck with your farming. I am having a Tiny Farm blog withdrawal symptom. Hope you will be able to update on your summer activities. Hope everything is going ok. Killing baby plants is always a downer. Do you find that more than 4 onions per cell gets way too crowded? Last year I had a similar situation but just let them all grow together–many cells with about 10 onions each. I was impressed by how well they turned out. Onions don’t seem to give a darn about being crowded during their infancy. I had some cippolini onions that were planted in this crowded fashion and then got neglected and weren’t transplanted until about 6 months (!!) after they were first planted in flats…and they turned out marvelously. I’m now harvesting great big cippollini’s for market. My biggest problem with onions is that I want to plant in fall, but there’s about 50 percent chance of winter flooding in my main field, so am always hesitant to plant in October. Do you generally grow over winter, or spring/summer, or both? I’d be interested to hear anyone’s thoughts on this. I put your link into my blogroll. You have a nice little farm. Been thinking about lately but now I think I can do this: gardening. Mark: You have a nice little farm. Been thinking about lately but now I think I can do this: gardening. Go to our site to see what we have done this year. We took the plunge and it worked out just fine. Next year we want to comtinue but bigger, up to 7 acres. What a nice post! Love your sharing! Please keep moving, I will follow your blog.